In section 7.1 we had studied that the linear equation of the generic form y=mx+c is a straight line. We have learnt that every straight line can be represented as a linear equation. We have also observed that any point on the line satisfies the linear equation and conversely, any point which satisfies the linear equation lies on that line. The ‘inclination’ of a line is the angle which the line makes with x axis. If inclination angle is measured in clockwise direction as in Figure 2, is negative. The ‘slope’ of a straight line is the tangent (tan) of inclination and is denoted by letter m. m=tan . Let P (x1,y1) and Q (x2,y2) be the two given points. We are required to find the slope of the line PQ. 1. Note that slope of two parallel lines are same. Conversely, if the slopes of two lines are same then they are parallel. 2. From above, it follows that slopes of lines joining points on a straight line are same. Let BA AC. 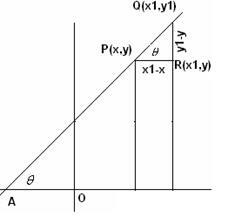 Let be the angle of inclination of AB with x axis. Slope of CA = - tan = - (AB/AC) Slope of AB * Slope of CA = (AC/AB)*-(AB/AC) = -1. In section 7.1 we have learnt what intercepts are. x-intercept is the distance from O to the point where the line cuts x-axis(x co-ordinate). y-intercept is the distance from O to the point where the line cuts y-axis(y co-ordinate). We have studied that y=mx+c is the general format for the equation of a line and we have also studied what slope is. Let us formulate an equation for a given line. Let P be any point on the given line with co-ordinates (x,y). Let AB be the line and be it’s angle of inclination. i.e. y = mx+c is the equation of the given line AB. Let AP be the line and be it’s angle of inclination. Let Q(x1.y1) be any point on AP. Let R(x2,y2),Q(x1,y1) be two points on the given line AB. We are required to find the equation of this line. i.e. y = mx+(y1-mx1) where m = (y2-y1)/(x2-x1) which is of the form y=mx+c. This is the equation of the given line AB passing through 2 points. 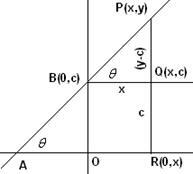 Let P(-a,0) and Q(0,b) be the x and y intercept respectively of the line AB. 7.3 Problem 3: A(1,4),B(3,2) and C(7,5) are the vertices of a triangle ABC. (ii) Slope of the line passing through G and || to AB, is same as the slope of AB. y = mx+(y1-mx1) Note: Here x1 and y1 are co-ordinates of G.
i.e. 3x+3y = 22 is the equation to the line, parallel to AB and passing through the centroid G of the triangle ABC. 7.3 Problem 4: The mid points of three sides of a triangle are (5,-3), (6,6) and (-5,3). Find the equation of the sides of the triangle. so that the co–ordinates of D, E and F are (5,-3), (6,6) and (-5,3) respectively. We are required to find the equation to the lines BC, AB and AC. Equation of lines parallel and perpendicular to a given line. Let L be a line passing through the point (x1,y1) with slope m.
Then the equation of L is y = mx+(y1-mx1) which is of the form y=mx+c1 where c1 = (y1-mx1). Let L1 be a line parallel to L and passing through the point (x2,y2) with slope m1. Since L and L1 are parallel, m=m1. Hence the equation of L1 is y = mx+(y2-mx2) = mx+c2 ,where c2= (y2-mx2). 1. Thus equations of two parallel lines differ only by constants. Let L be a line passing through the point (x1,y1) with slope m = tan . Let L1 be a line perpendicular to L and passing through the point (x2,y2) with slope m1. 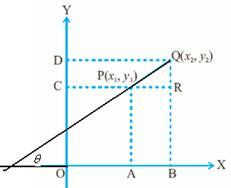 Earlier in this section, We have learnt that product of slopes of two perpendicular line is -1. Let ax+by+c = 0 be an equation in first degree. (iii) If b is non zero then y = (-a/b)x-(c/b) = mx+c which represents an equation of a straight line. 3. Thus ax+by+c = 0 represents an equation to a straight line.